Britain's favourite men's skin care range releases a new face cream that blows its competition out of the water - and what's more, it's only £10 a pot! We won't lie to you, and if you're an avid reader of The Male Grooming Review, you'll already know how much we love the whole Bull Dog men's skincare range, from top to toe. With all the products in this naturally formulated range priced well under £10, great skin care has never been as affordable for men looking to get the very best out of their skin on without breaking the bank balance. 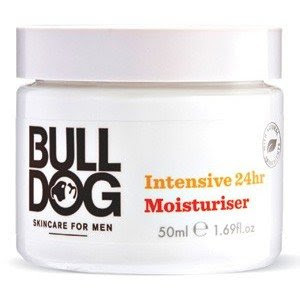 Bull Dog's latest addition to this fine collection is the Intensive 24hr Moisturiser, packaged in a beautiful white glass 50ml jar. With the scent and texture staying true to the rest of the moisturisers in this collection, this face cream goes way above and beyond anything we've experienced in this price range. This cream is packed with eight essential oils, plus borage almond and camelina to deliver intensive 24 hour hydration, offering firmer and smoother skin with reduced dryness. This formula has been purpose built for men and is designed to be non-greasy, making it ideal for men prone to dry skin. If, like us, you're already a big fan of the Bull Dog range, then we recommend you get your hands on this stunning face cream - we promise you'll absolutely love it! 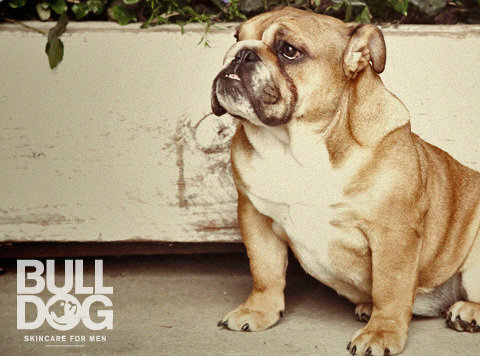 The full Bull Dog range is available at most major supermarkets in the UK, along with Boots stores. Full ingredients: Aqua (Water), Prunus amygdalus dulcis (Sweet almond) oil, C12-15 alkyl benzoate, Glycerin, Glyceryl stearate citrate, Myristyl myristate, Isononyl isononanoate, Sodium polyacrylate, Polysorbate 20, Camelina sativa seed oil, Phenoxyethanol, Cetearyl alcohol, Borago officinalis (Borage) seed oil, Benzoic acid, Dehydroacetic acid, Trisodium ethylenediamine disuccinate, Citrus limon (Lemon) peel oil, Citrus aurantium bergamia (Bergamot) peel oil, Ethylhexylglycerin, Artemisia vulgaris (Mugwort) oil, Pelargonium graveolens (Geranium) oil, Pogostemon cablin (Patchouli) leaf oil, Juniperus virginiana (Cedarwood) oil, Citrus aurantifolia (Lime) oil, Vetiveria zizanoides (Vetiver) root oil, Tocopherol, Citric acid, Sodium hydroxide, Limonene, Linalool, Citronellol, Citral, Evernia furfuracea (Treemoss) extract, Geraniol.